Tablescapes are often assumed to be the same thing as centrepieces but they are made up of more than just the main flower arrangements. These decorative designs include the entire space around the floral centrepiece, so that the rest of the table is decorated as well. Displaying full tablescapes in a shop or shop window is a smart idea for professional florists who hope to sell such displays in full or offer each element for sale individually. Large arrangements, small arrangements, bud vases, candles, vessels filled with other decorative items and even piles or displays of thematic items are all common elements of tablescapes. Wonderful ideas for autumn tablescapes include back to school themes, foliage themes, Halloween themes and harvest themes. 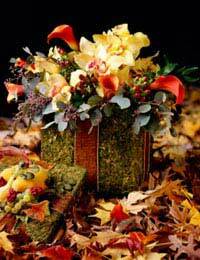 Both amateur and professional florists can create eye-catching tablescapes which celebrate the autumn season. Drawing on in-season flowers, accents from the local environment and childhood favourites should help tug at the heartstrings of all who see them. Back to school, foliage, Halloween and harvest themes are perennial favourites for autumn tablescapes which are enjoyed by friends, relatives and customers alike.